The origin of the Georgian alphabet is controversial. 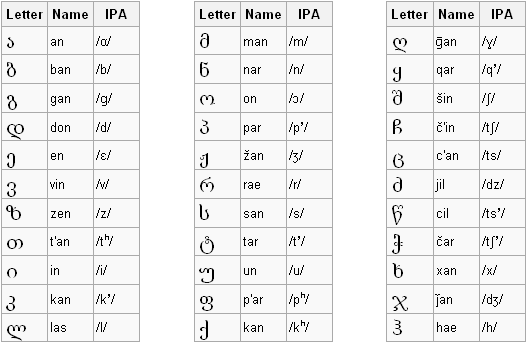 Whereas the Roman and Greek alphabets are the results of slow and gradual transformations of older scripts (rather than of deliberate creation), the Georgian alphabet shows up in history pretty much out of nowhere. This makes it plausible that it was invented, either by one person or several. So the obvious question is: who did it? Historical tradition gives two conflicting answers. The first comes from a medieval Georgian chronicle called “The Lives of the Kings of Kartli.” It tells of Parnavaz, the first Kartlian king, who reigned in the third century BC. Among other exploits, the chronicle has it that Parnavaz devised the Georgian “script” (მწიგნობრობა, mtsignobroba). Some have interpreted this to mean that he developed the Georgian alphabet, but mtsignobroba can also mean “literacy” or simply “writing.” This writing could have been writing in the Georgian alphabet, but more likely it was writing in the Aramaic alphabet, which at the time was the script of the Persians. This is confirmed by archeology, which has found pre-Christian traces of the Aramaic alphabet in Georgia, but none of the Georgian. Georgian schoolchildren are taught this story. 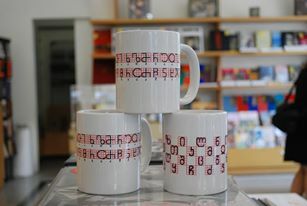 The gift shop of the Georgian National Museum sells coffee mugs depicting the old Georgian alphabet. The mugs state that the alphabet was created in the 3rd century BC. I tried explaining (in Georgian) to the gift shop worker that this is not correct, but I don’t think I convinced her. Q: Where are you going? Q: Cool, I have a cousin in Athens. A: No, I don’t mean Georgia the American state. I mean Georgia the country. Q: There’s a country called Georgia? Q: Oh right, I think I’ve heard of that. Isn’t it, like, in Eastern Europe? A: Not quite. It borders southern Russia, but it also borders Turkey, and it’s much closer to Iran than it is to any European country. But it’s not really Central Asian either. You could say it’s part of the Middle East if you didn’t care about being sloppy, or you could call it Near Eastern if you didn’t care about sounding like you’re from the 1800s. Take a look at this map if you don’t believe me. Georgia is in Europe, just like Iran. Travel advertisers typically bill Georgia as being “at the crossroads of East and West,” which, while cheesy, might be accurate. 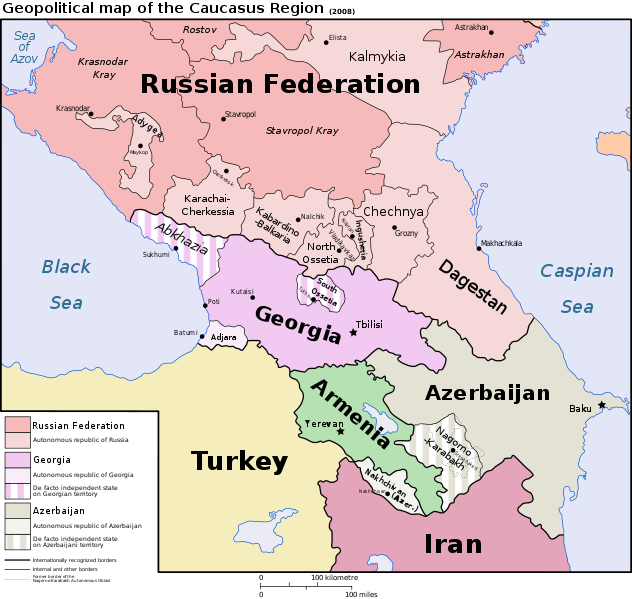 All this generally holds also for Armenia, which borders Georgia to the south, and to a lesser extent for Azerbaijan, which borders Georgia to the southeast. Q: But they must be European, since they play in the big European soccer league. A: And the Rams play in the NFC West. So what? Q: Fine, but it was part of Russia, right? A: Yes. Having been conquered and destroyed several times over the centuries (by the Romans, the Persians, the Arabs, the Mongols, and the Turks), Georgia looked to Russia for protection and was annexed at the beginning of the nineteenth century. After the Russian Revolution, Georgia enjoyed a few years of independence, but was soon re-conquered by the (Soviet) Russians. After the collapse of the Soviet Union, Georgia became independent again. That’s pretty much where things stand today. Q: And they speak Russian there? Q: Some other Slavic language? Q: A language even distantly related to Russian? A: Wrong again, idiot. The Georgian language is not related to any major language. It is not part of the Indo-European language family (which includes most European, Persian, and Indian languages, as well as Armenian), the Uralic language family (which includes Finnish, Hungarian, and some Siberian languages), the Afro-Asiatic language family (which includes Arabic and Hebrew), or the Turkic language family (which includes Turkish and Azerbaijani). 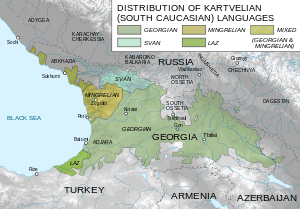 Georgian belongs the Kartvelian language family (also called South Caucasian), which also includes Laz, Mingrelian, and Svan. However, none of these other languages have standardized written forms, all are spoken alongside Georgian, and the three combined have fewer than a million speakers, so practically speaking we can ignore them and say that Georgian is not related to any language anywhere at all. Don’t worry, I had never heard of these either. It has been proposed that Georgian might be related to Basque or some other language isolate, but this is just linguists’ fanfic. Q: So the Caucasus is home, if I’ve counted right, to three distinct language families? A: You did count right, but no. In fact there are two more. Georgian is spoken on the south side of the Caucasus mountains. 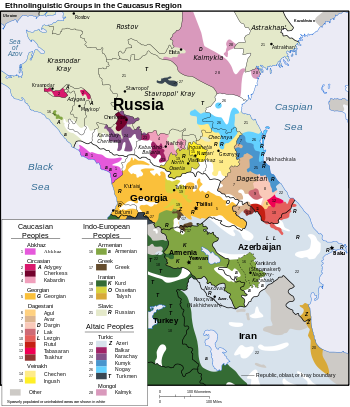 To the northwest of the mountains are spoken the Northwest Caucasian languages, including Abkhaz, and to the northeast of the mountains are spoken the Northeast Caucasian languages, including Chechen. Neither of these families is related to the other, or to Georgian, or to anything else. Q: The Caucasus sounds like a very linguistically diverse region. A: I’m glad you asked. Take a look at this map, which gives a good idea of what a mess the whole place is. Q: Do they use the Latin alphabet or the Russian? A: No. They use their own alphabet. It doesn’t look anything like either of those alphabets or the Greek alphabet. This alphabet has two T’s, two P’s, two K’s, two TS’s, and two CH’s, which makes transliteration a crapshoot. Armenian also uses its own alphabet, and it doesn’t look anything like the Georgian one. Believe it or not, this is a real alphabet in use today. To make things more confusing, there is an old form of the Georgian alphabet which does look like Armenian. Fortunately, it’s not in use anymore today except for decorative purposes. There’s another alphabet that came after this one and before the modern one, but I won’t bore you with it. Incidentally, the phrase “Russian alphabet” is a pet peeve of mine. Although the Russians do have an alphabet different from ours, many other languages also use that alphabet. Us saying “Russian alphabet” would be like Russians talking about the “French alphabet.” The proper name for their alphabet is “Cyrillic,” so-called because it was devised by ninth-century missionary and burlesque stripper Lili St. Cyr. St. Cyr and her brother Methodius are credited with inventing two alphabets for the Slavs. In case you were wondering, Azerbaijani and the rest of the Caucasian languages generally use Latin or Cyrillic according as whether or not they hate the Russians. Q: Good story. So are they Muslims over there or what? A: No, for the most part. About 10% of Georgians are Sunni Muslims, and most of them are located in the southern “autonomous republic” of Adjara. The rest of the Georgians are Orthodox Christians. Q: Oh, are they Catholic or Protestant? A: Wow you’re stupid. Orthodoxy is distinct from both, and in fact Orthodoxy is older than Protestantism. 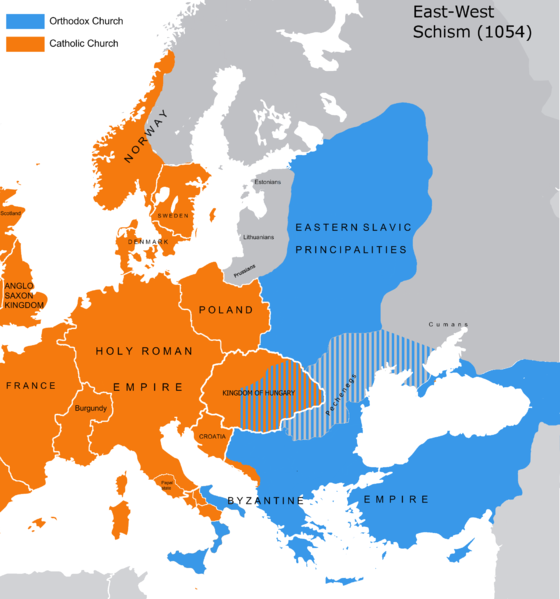 It is exactly the same age as Catholicism, since the two resulted from a schism in what was one church. Basically, cultural differences and political problems led the Western and Eastern parts of the old Roman Empire to excommunicate each other around 1100. Orthodoxy is the church that resulted in the East and Catholicism is the church that resulted in the West (which would, of course, later splinter again with the Protestant Reformation). Georgia is in the East, so it’s Orthodox. Georgia is on this map, but it almost isn’t. Q: So that’s why Greek and Russian churches look so weird. A: No. The Armenian church is part of Oriental Orthodoxy, as opposed to Eastern Orthodoxy. The Oriental churches (which today also includes the Christianity practiced in Egypt and Ethiopia) broke off from the rest of Christendom in the fifth century. Their separation was due not to any power struggles, but to a good old-fashioned Christological debate. The question was simple: is Christ human? divine? both? neither? or what? The Nestorians held that he had two natures, one divine and one human (the two-nature view is called dyophysitism). The Eutychians held that although Christ was both human and divine, his humanity was vanishingly small in comparison with his divinity, so that his nature was pretty much just divine (monophysitism). 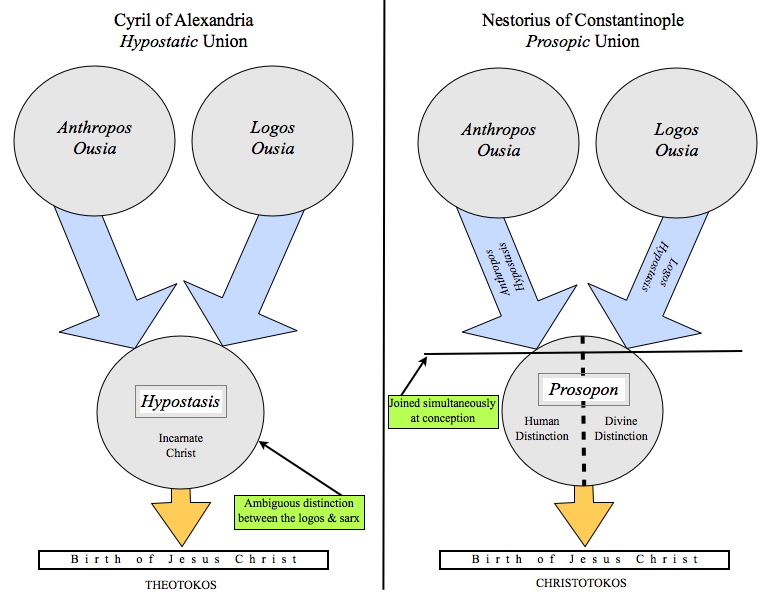 To settle this problem, the Council of Chalcedon in 451 came up with a compromise: Christ has two natures, but just one person, and the two natures are united perfectly in that person (this is the doctrine of hypostatic union). The churches that would eventually become Oriental Orthodox rejected this solution, arguing that it amounted little more than Nestorianism. Instead, they claimed that Christ had only one nature, but that this nature was itself both divine and human (they call this position miaphysitism), and they went on to establish their own church on this basis. I bet you didn’t think you would learn anything about Christology on this blog. Q: That is so boring that I can’t even finish the paragraph. A: Well, that’s pretty much how theology goes. The take-away here is that the Armenians don’t belong to the same church as the Georgians. Q: But there are Muslims near Georgia, right? A: Yes. The Chechens and some other people to the north of the Caucasus are Sunni Muslims, and in Azerbaijan nearly everybody is a Shia Muslim (this is due to Persian conquest). I leave it as an exercise for the reader to find Azerbaijan on this map, and also to figure out what the colors mean. However, such self-identification is mostly nominal, Azerbaijan is one of the most irreligious countries in the Muslim world. Indeed, my understanding is that this is also true in Georgia, where being Orthodox is more of an national affiliation than a religious one (just as being nomincally Catholic is often considered an important part of being Italian or Mexican). Q: How are the gender roles in Georgia? A: I’ve heard it’s very patriachal, but I can’t say for sure yet. Expect a report on the matter. Q: What about the food, scenery, weather, etc? A: I’m there will be plenty of time to discuss that stuff when I get there. Q: It sounds like you intended this Q&A to cover general cultural, historical, and geographical background, and not so much the concrete details of everyday life with which you have no experience. A: Uh…yeah, that about sums it up.